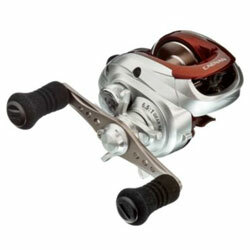 Shimano's Caenan Baitcast Reel offers the features serious anglers demand, in a quick, affordably priced reel that's rated for use with mono, fluorocarbon or braid, in both fresh and saltwater. For casting even the lightest baits, there's an aluminum lo-mass spool with disengaging levelwind plus 6 shielded stainless steel ball bearings for long-term smoothness; Super Stopper instant anti-reverse with Assist Stopper backup; VBS braking; Quickfire II clutch bar; and drilled handle shank. "Can I tell you something THIS IS THE BEST REEL for the money you can find it casts a mile and never backlashes I LOVE MINE"
"True it is not made of the same material as the Curado or the Chronach but it works great and the price is excellent." "I bought this reel a few months ago for a Lower Laguna Madre fishing trip and finally got to take it out this past weekend. This is the first baitcast that I've ever owned or tried. This thing was out casting everyone in the boat, by 10-20 yards! I only backlashed once really bad because I hit the net on the backswing. Breaking system is great, after I got more and more comfortable with it, the more breaks I took off."